Sanctions continued for Ahly striker Ahmed Abdel-Zaher, who fell afoul of Egyptian football officials last month after making the four-fingered Rabaa solidarity sign at the African Champions League final. The gesture got the 28-year-old suspended and deprived of his Champions League bonus. It was also announced that he would be put up for sale in January. On Thursday, however, the Egyptian Football Association (EFA) took the sanctions a step further, announcing that Abdel-Zaher has been banned from representing Egypt for one year. He has also been imposed with a three-month local ban. 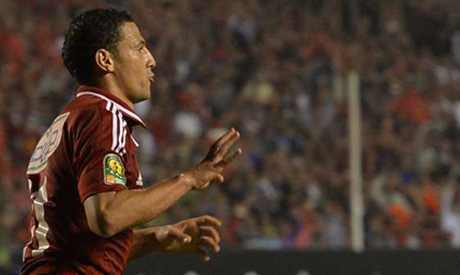 Abdel-Zaher, who was bought by Ahly last summer from ENPPI, featured in 10 games for the Pharaohs, scoring two goals. He was instrumental in Ahly's triumphant campaign in the African Champions League, scoring three times, including a pivotal goal in the final against South Africa's Orlando Pirates. The player should not have to suffer, or have his career ruined, he apoligzed for his mistake. What a bunch of hypocrites, the Egyption fa are. They bring politics in to sport, does not match, he made a mistake and apoligized , should have been end of story, but the fa is bringing politics in to sport, hypocrites. If Morsi was in power, I wonder where there stance!.